"Henry is enjoying a book that’s he is reading while his puppy Mudge tries to get his attention. At first, Mudge is subtle, stealing Henry’s sock and then chewing on the boy’s shoelaces. Soon, the pooch begins to make more obvious statements: sitting on Henry’s foot and then on his lap. When Mudge sits right on his book, Henry finally gets the point and plays with the dog. Mudge’s realistic dog behavior is hilarious, and kids will get a kick out of seeing and hearing how his techniques quickly escalate. Sucie Stevenson’s simple and colorful illustrations are a perfect complement to Rylant’s text (Simon Spotlight, 2005). Suzanne Toren’s narration is spot-on, and the dog sound effects are perfect. Page-turn signals are optional. Young children will laugh at Mudge’s antics, while following along with the early-reader text." "The following is a combined review of PUPPY MUDGE FINDS A FRIEND and PUPPY MUDGE WANTS TO PLAY.] 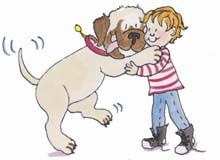 --Young listeners have the pleasure of sharing the adventures of Rylant's beloved Henry and his faithful St. Bernard, Mudge, in his puppy years. In PUPPY MUDGE FINDS A FRIEND, Mudge playfully torments a cat buddy. In PUPPY MUDGE WANTS TO PLAY, he desperately tries to get Henry's attention for a good romp. Suzanne Toren narrates with gentle voice, leisurely pace, and frequent pauses that enable youngsters to turn pages and to savor Stevenson's signature illustrations. Toren's voice is clear and strong. She excels in portraying a disgruntled but loving Henry as he responds to Mudge's pestering. Music and sound effects provide an animal-friendly background of panting, mewing, and drooling, as well as crumbling crackers and thumping footsteps."